Meatless Monday is back again and this week I made stuffed onions. How much fun is that? I remember growing up my mom used to make stuffed peppers a lot. 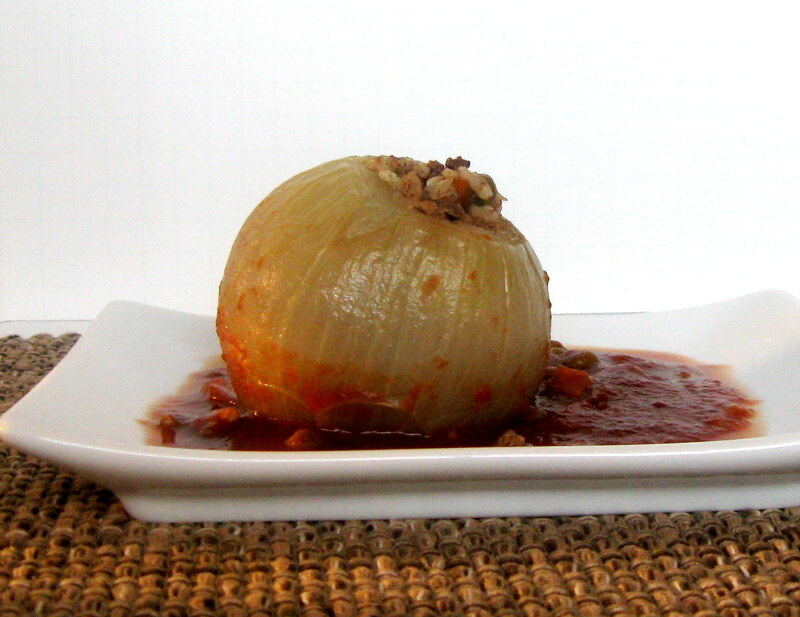 One of the great things about stuffed onions (or stuffed peppers) is that you can toss in whatever you have on hand. These are also made in the slow cooker so once the initial prep is done then it's actually done and you can enjoy the rest of your day. Feel free to make this with actual ground beef too! When my husband and I were eating these we decided they would be awesome with a side of potatoes because then it would be just like shepards pie. I served it with a salad because I knew it had a fair amount of veggies already in it. 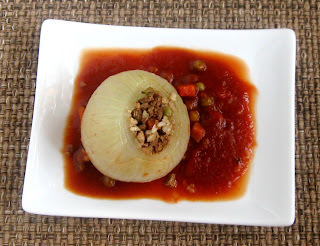 Aside from using a melon baller to take the middles out of the onions, then this was a quick recipe to toss together and pop in the slow cooker. I'm sure you could always substitute peppers for the onions if you really wanted to and they would cook just as well in the slow cooker. As I was talking about adding whatever you have on hand into this I was thinking corn, finely diced potatoes, zucchini, peppers, diced carrots...pretty much anything that you think would be good. So why don't you try it and let me know what you think? 1. Trim just enough off the bottom of the onion so that it will still hold the onion together. Trim about ¼” off the top of each onion, carefully peel each onion if you haven’t already. Using a melon baller scoop out the middle of the onions leaving 1-2 outer layers in place. Chop and freeze onion middles for another use or discard them (we made soup). 2. In a medium bowl combine the soy crumbles, rice, about ½ cup peas and carrots, sage, salt and pepper. Fill the onions with the soy crumble filling making sure they are completely full and packed pretty firmly. Place the onions in a slow cooker and fill the space around them with the remaining peas and carrots. 3. In a small bowl stir together the tomato sauce, vegetable stock, Worcestershire sauce. Pour the sauce in the bottom of the slow cooker around the onions, being careful not to pour it over the top of the onions. Cover the slow cooker and turn on high for 3-4 hours or low for 6-8 hours. If desired, sprinkle 1 tablespoon fresh dill over the tops before serving.